A devastated Earth's last hope is found in Pearls: small, mysterious orbs that fall from space and are capable of supplying enough energy to power entire cities. Battling to control the Pearls are the Skyship dwellers—political dissidents who live in massive ships in the Earth's stratosphere—and the corrupt Surface government. I had seen this book around and when I got a copy, I decided to read it as soon as I could because I had heard so much buzz about it. Part of the reason is because it seems like such a different read. The plot was intriguing and that cover definitely pulls you in. Two boys meet while each tries to retrieve a Pearl, these objects that fall from the sky and provide energy for ships and cities. Jesse is from Skyship, while Cassius is from the Surface. When they meet, a spark changes them dangerously. Cassius goes back and burns his room to ashes without meaning to. Jesse too has a reaction that scares him. The two are enemies but there is something that draws them together. Something about the Pearls. 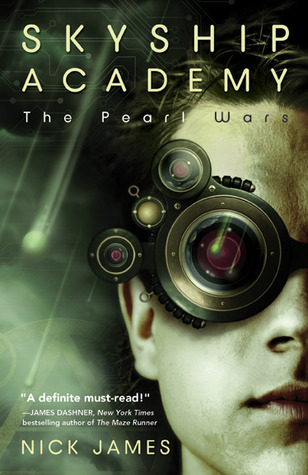 The Pearl Wars is the first of what I imagine will be one awesome series. There are a million questions at the beginning of the book and by the end there are few answers. It's a science fiction action adventure where two boys must come to terms with their past and figure out what their future is together. I loved the political aspect of the book as well, why these two factions separated themselves between the Surface and the Sky. The characters were intriguing and the plot moved quickly so that the book was a fast, entertaining read. I'll definitely be looking forward to the next in the series. A great book for fans of action adventure with science fiction elements.